The PeakTech PKT 3320 is a little and compactly Digital Multimeter, that should not fail in any electronic workshop. The Digital Multimeter is built to the highest safety standard CAT III 600 V / CAT II 1000 V and in very modern design. With its back lighted display, the 6000 counts display and the bar graph display, the Digital Multimeter PeakTech PKT 3320 is easy to read by everyone. Also the functions MAX, MIN and HOLD of the Digital Multimeter facilitate the evaluation of the measured values. Of course, the Digital Multimeter commands about an auto-range function, which can be switched to manual operation when needed. The Digital Multimeter measures voltage and power via TRMS. In addition to this measurements, with the Digital Multimeter it is possible to arrange measurements like duty cycle, diode test, continuity check, resistance, capacity, frequency and temperature. 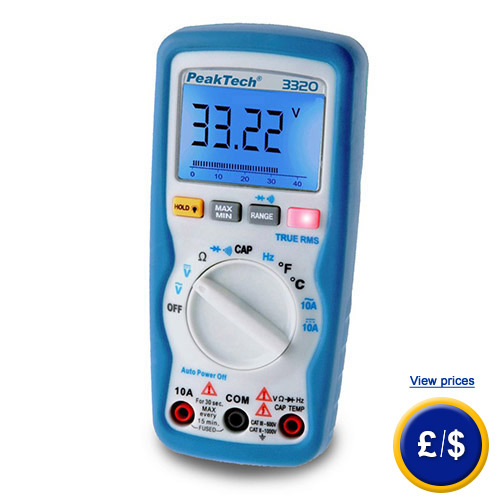 The non-contact voltage detection to the front of the Digital Mulitmeter PeakTech PKT 3320 and the auto power off function completes the functional range of the Digital Multimeter. For further information about the Digital Multimeter PeakTech PKT 3320, please read the following technical data or call our Hotline: UK customers +44(0) 23 809 870 30 / US customers +1-410-387-7703. You can also reach us through our contact form. Our engineers and technicians will gladly advise you regarding the Digital Multimeter PeakTech PKT 3320 and all other products in terms of regulation and control, or scales and balances of PCE Instruments. ± 1,2 % + 2 dgt. ± 1,5 % + 10 dgt. ± 2,5 % + 5 dgt. ± 3,0 % + 5 dgt. ± 1,0 % + 2 dgt. ± 5,0 % + 5 dgt. ± 1,2 % + 3 dgt.